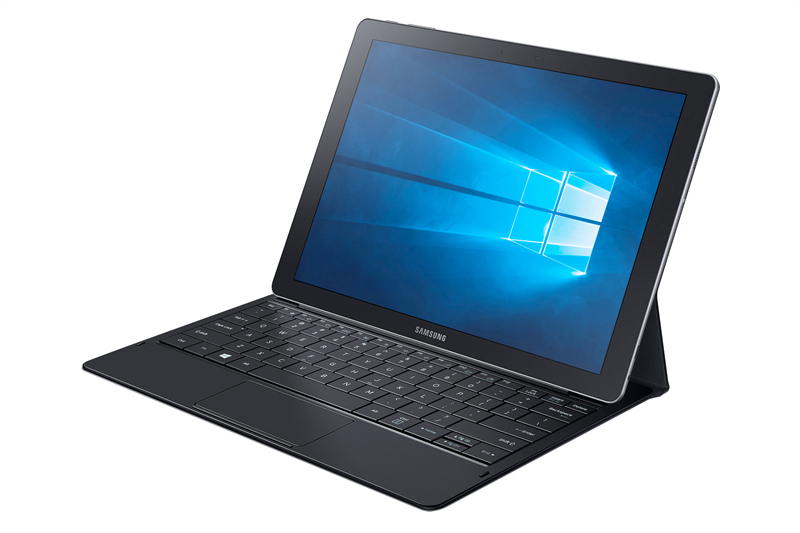 Samsung’s new Galaxy TabPro S looks more than a little familiar: it’s basically a clone of the Surface Pro. The new 12-inch tablet is a convertible device that runs Windows 10, sports 4GB of RAM, a 2.2 GHz Intel Core M chip, AMOLED screen with a resolution of 2160×1440 and weighs just 693 grams. To contrast, the Surface Pro 4 weighs in at 766 grams with a 12-inch screen, but it uses Intel’s Core i5 and i7 processors, rather than the Core M and a 2,736 x 1,824 resolution display. Most interestingly, the battery can fully charge in 2.5 hours, but supposedly offers up to 10.5 hours of battery life for all day use. It actually comes with the keyboard cover for free, which connects just like the Surface Pro as well, using a pogo-pin connector so you don’t need to pair it. What’s most interesting, however, is that Samsung’s crammed in a category 6 LTE modem, so you can slap in a SIM card and surf the Web without needing to use a hotspot. The Galaxy TabProS will be available later in 2016, but Samsung hasn’t confirmed how much it’ll cost.